Subtle changes in memory that concern you may be an early warning sign of declining mental skills. Get an assessment. Forgetfulness becomes more common with age for most of us. But even if your doctor says your memory is perfectly normal for your age, you may still be concerned about memory slips that seem new or unusual. Recent research suggests that sometimes (but not always) these changes may be early warning signs of future decline. But this merits a closer look, not a panic attack. "We don't want to worry the public that if they forget where their keys are they are on the path to Alzheimer's disease," says neuropsychologist Rebecca Amariglio, an instructor in neurology at Harvard Medical School. "But there is a growing appreciation we should not dismiss those concerns. It may be worth talking to a doctor and getting a baseline assessment." Having trouble recalling the names of unfamiliar people. Having difficulty remembering important details of recent events. A change in memory compared with when you were younger. Difficulty following the plot of a television program or book because of memory problems. Memory changes similar to other people of the same age. Memory changes that are worse than those of people your same age. Misplacing items, but later recalling where you put them. Misplacing items, and being unable to relocate them later. A recent study that Amariglio worked on used information from the Harvard-based Nurses' Health Study to explore whether subjective memory complaints, or concerns about one's own memory, could be used to identify people with cognitive impairment. Cognitive impairment—sometimes called cognitive decline—is a catchall term that covers memory loss and worsening of basic thinking skills. Such impairment sometimes (but not always) progresses to dementia. About 17,000 women, mostly in their 70s, were involved in the study. Researchers asked the women if they had noticed any of seven different kinds of memory changes. Then they administered two standard tests to measure cognitive impairment. Women who reported noticing certain types of memory changes were more likely to also show signs of cognitive impairment. One such warning sign identified in the study is finding it hard to follow a group conversation or the story in a TV show. Another example is feeling that your memory skills are worse than that of friends your own age. However, some common memory concerns were not strongly associated with cognitive decline in the women. One is forgetting things from one second to the next—for example, walking into a room and forgetting why you went there. Another is occasionally misplacing personal items, like a wallet or car keys. 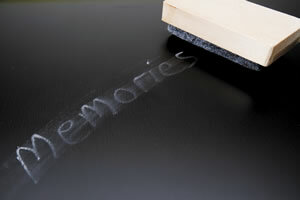 Such minor memory slips are usually considered signs of benign age-related forgetfulness. In other studies, Amariglio and her colleagues have linked subjective memory concerns to having more beta amyloid in the brain. Beta amyloid is a protein associated with Alzheimer's disease. "People who are completely normal, but who have a subjective sense that their memories are changing for the worse, are more likely to have amyloid collecting in their brains, which is a risk factor for developing cognitive decline later," Amariglio says. Using self-reported memory changes to identify people who may be at greater risk of cognitive impairment is a new idea that needs to be tested more. Noticing memory changes doesn't mean you are definitely going to develop cognitive impairment or dementia. But don't completely ignore them, either. "It could not hurt to check it out—if just to start a conversation with your doctor," Amariglio says. Your physician could do a quick cognitive check in the office or possibly refer you for more extensive testing. That creates a baseline to compare later changes, if they happen. In the meantime, there are many ways to compensate for memory slips once you notice changes (see "Easy memory helpers"). And though there is no medical treatment for cognitive decline, you can keep your mind sharper by exercising, eating right, and staying mentally active. Keep your keys, phone, and eyeglasses in the same place every day. Pay closer attention when you need to remember details. Do one thing at a time; multitasking increases forgetfulness. Repeat names of new acquaintances, silently or aloud. Link a person's name to a rhyme or vivid mental image. Repeat important facts back to people as you talk to them. Eliminate distractions when you're trying to learn something. Read instructions more than once on different occasions.